Note: This appears as Chapter 3 in Missile Defense 2020: Next Steps for Defending the Homeland. Today’s homeland missile defense efforts rest on an integrated system encompassing a wide range of sensors, interceptors, and command and control mechanisms. Since late 2004, these have provided a limited defensive capability against an unsophisticated ICBM threat posed by countries like North Korea and Iran. The system is currently optimized for North Korean threats, and past decisions have de-emphasized sensors and interceptor placement advantageous to countering long-range Iranian missile development, especially against the East Coast of the United States. 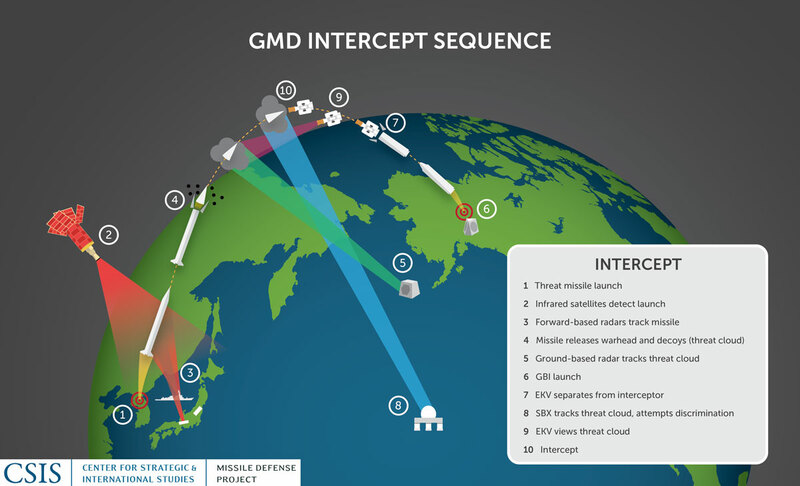 The current Ground-based Midcourse Defense (GMD) system is, however, also burdened with numerous interceptor configurations, older ground system hardware and software, and lower reliability. The qualitative improvements that were planned and expected to follow the initial defensive capability have not yet come to pass. Significant improvements are currently under way to address these issues, most notably with near-term improvements to discrimination, a redesigned kill vehicle, and improved sensors. Longer-term advanced technology programs, such as investments in directed energy and volume kill, are once again being explored after a hiatus of several years. GMD and its associated systems span 15 time zones, including interceptors at two locations, seven types of sensors on land, sea, and space, and multiple and distributed fire control systems (see Table 3.1 and Figure 3.1). The challenge of deploying this global architecture in short order involved stitching together preexisting sensors and shooters from a wide array of Cold War–era systems that had not originally been designed for the mission. The 2002 decision to field a limited defense capability by 2004 left little choice but to embrace and adapt these systems in prototype form. This left the initial GMD configuration with several deficiencies, most notably the lack of fully integrated, geographically dispersed radars. It also presented the daunting challenge of simultaneously fielding an operationally viable system while still developing many of its component elements and weeding out technical flaws in the system overall. Despite much progress, the system remains in what might be described as an advanced prototype form, still owing much to technologies and a basic design dating from the 1990s. The evolving requirements of simultaneously developing, fielding, maintaining, and upgrading a complex, operational system have also resulted in a patchwork of kill vehicle types, lacking in uniformity with a high number of possible failure points. Less reliability also means a higher shot doctrine, which directly reduces the effective magazine. Upon the launch of a hostile long-range ballistic missile, a network of infrared satellites alerts the system, which cues another network of ground- and sea-based radars. These classify the threat, determine its trajectory, and compute a firing solution. One or more GBIs are then launched, which today are comprised of a three-stage booster carrying an Exoatmospheric Kill Vehicle (EKV). Terrestrial radars continue tracking the target missile, sending information into the GMD Fire Control (GFC), which is fed to the interceptor via one of six active In-Flight Interceptor Communications System (IFICS) Data Terminals, or IDTs, located throughout the United States. 44 Ground-based Interceptors by end of CY17. As the incoming missile begins to separate and deploy decoys, higher-resolution radars such as the SBX attempt to identify, or discriminate, the lethal warhead from within the accompanying cloud of debris and decoys. Data from these sensors are then fed to the interceptor. Upon burnout of the GBI’s final stage, the kill vehicle separates and activates infrared and electro-optical sensors to locate the warhead. Using its Divert and Attitude Control System (DACS), the EKV maneuvers itself into the path of the warhead and collides with it, destroying it with the force of impact. Sensors then conduct a kill assessment to determine if the threat was destroyed or if additional interceptors are required. If the threat is not destroyed, and if time permits, a new firing solution can be formulated for an additional interceptor salvo. To improve capacity and reliability, MDA’s current path forward is roughly divided into three phases: Enhanced, Robust, and Advanced.3 Although the phases overlap in terms of technology development, they reflect sets of development and deployment goals (Table 3.2). The first of these three phases is currently under way, under the umbrella of Enhanced Homeland Defense (EHD). Efforts to field 44 GBIs are on schedule to be completed by the end of calendar year 2017. That fleet of 44 will include a mix of three EKV configurations: 20 CE-Is, 16 CE-IIs, and 8 CE-II Block 1s (Figure 3.3). During this period, MDA plans to only conduct two intercept tests. The first will fly a CE-II Block 1 EKV against an ICBM-class target in FY 2017. The second, slated for the end of 2017, will test a salvo of two interceptors (CE-I and CE-II), also against an ICBM-class target. MDA is also currently planning its first nonintercept flight test of an RKV with a two-stage/three-stage selectable booster in mid-2018, but slower development of either component would delay this timeline. Another element of RHD concerns modifications to the booster. The planned changes will allow the warfighter the flexibility to select a two- or three-stage booster at will. One or the other may be preferable depending on when the interceptor is launched and where the threat missile is intended to be engaged. Currently deployed C1 and C2 boosters all have three stages, which limits them to longer range shots—all three stages must burn before the EKV may be deployed and engage an incoming missile. The ability to “shut off” or simply not fire the third stage, while not as optimal as a simple two-stage booster, will give the warfighter additional flexibility in firing doctrine and move toward a shoot-look-shoot ability. In addition to the “enhanced and “robust” phases, MDA is making early investments in nextgeneration systems falling under the heading of Advanced Homeland Defense (AHD). The focal point of the “advanced” effort is the development of a Multi-Object Kill Vehicle. The MOKV concept is to equip a single GBI with multiple, smaller kill vehicles, as opposed to the single, large kill vehicle the GBIs currently employ. Between 2022 to 2027, MDA plans one test per year of the RKV atop two-stage/three-stage selectable boosters, for a total of six intercept tests during the AHD phase. Although MDA’s current roadmap offers a cogent path forward, it also appears to include several potential shortcomings or limitations that have the potential to increase risk and cost or to decrease capacity and capability. The first potential obstacle is the multiyear production gap between the batch of kill vehicles currently being emplaced and future ones. After the CE-II Block 1s are produced to reach 44 by 2017, no procurement of interceptors is planned until RKV goes into production, which could be 2020 or later. This gap will present challenges for maintaining an active production line and maintenance capability, and restarting it after several years of inactivity could be difficult. This lack of continuity could further increase cost and time when RKV goes into production. A decision to accept the gap would also mean accepting delays and cost for additional kill vehicle production should threats grow and greater capacity be required before RKV is fielded. The second limitation in MDA’s current plan is an underappreciated reduction in near-term capacity. Although MDA and the Department of Defense frequently tout the “44 by 17” milestone, this phrase belies the fact that the number of fielded interceptors will then go down shortly thereafter. The planned production gap will coincide with a dip in the number of operationally deployed interceptors, resulting in only 40 deployed interceptors by 2021 (Figure 3.3). The 10 percent reduction in capacity is a result of expending GBIs in tests without replacing them, or more precisely the absence of operational or testing spares as had been identified in the 2013 Homeland Defense Hedging Policy and Strategy report to Congress.7 Additional rounds may be unavailable at any given time as they are taken in and out to recap the kill vehicles or upgrade the boosters. In a practical sense, current plans presuppose that the number of operationally available GBIs will be 40 or less in 2021. A third limitation is that under the current plan, the first RKVs produced in the 2020 time frame will go onto the older C1 boosters. C1 boosters have known reliability issues, including certain components that have reached obsolescence for which replacement parts can no longer be procured. Putting the newest kill vehicles atop the oldest boosters has the potential to undermine some of the reliability gains from RKV for several years. The final limitation concerns the lack of a persistent space-based sensor layer that has been a mainstay of every homeland missile defense architecture design across five administrations. Additional shortfalls include the midcourse discrimination gap over the Pacific which LRDR will not completely close, greater reliance on a fewer number of X-band radars, and the lack of an LRDR-like sensor for the Atlantic for threats from the Middle East. The story of homeland missile defense is also a story of budgetary decline, at least over the past decade. In general, the declining amounts for homeland missile defense (Figure 3.5) correlate to MDA’s overall funding level (Figure 3.4). 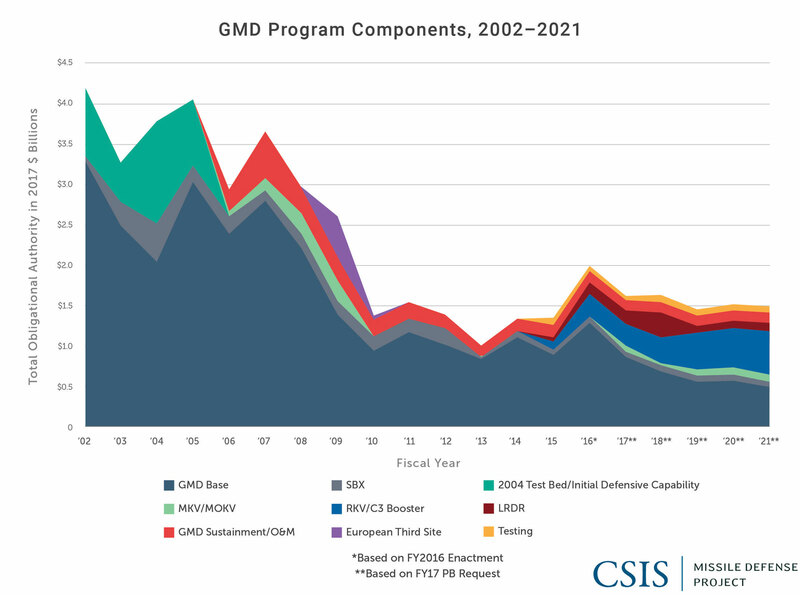 The comparison of FYDP projections to actual spending on GMD and associated homeland missile defense programs demonstrates a similar trend of reduced toplines over time. Gaps between expected and actual funding levels began to show up in FY 2008, although the year-to-year discrepancies are less pronounced than for MDA as a whole. Even more so than other components of the BMDS, the characteristics of GMD funding are distinct relative to other defense acquisition programs. This is due in large part to the special budgetary authority granted MDA to facilitate both rapid deployment of a limited homeland defense capability and continued evolution of an operational system. This flexible acquisition authority has allowed MDA to use RDT&E money for activities that might otherwise be classified as procurement, military construction, or operations and maintenance (O&M). Retaining nearly all GMD activities within RDT&E allows for greater flexibility to redirect funds between and among subaccounts. To date, nearly all GMD funding has fallen under RDT&E. Whereas procurement for THAAD, Aegis, and other programs has begun to be moved to the procurement account, to date GMD “procurement” funding has remained exclusively within RDT&E. The exception is GMD’s O&M, which has been classified as such since 2014. 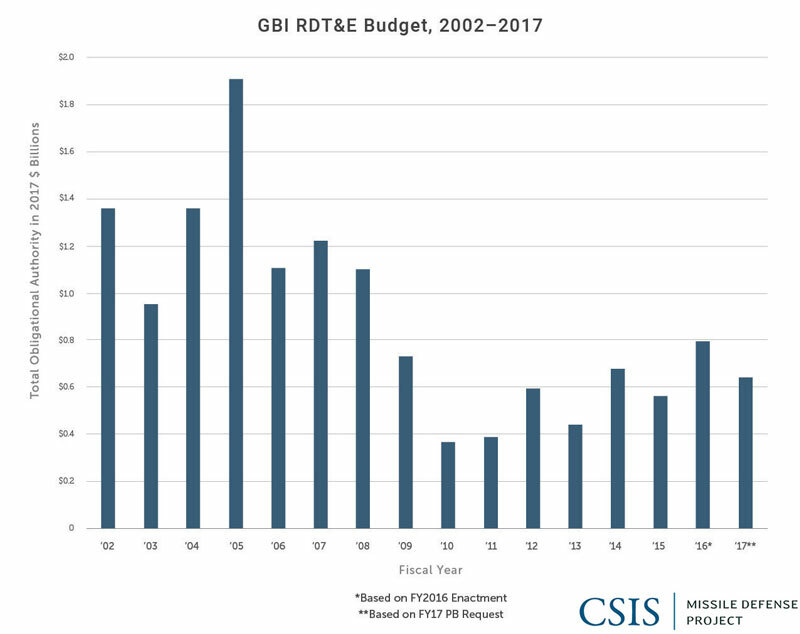 Even separating out early “procurement-like” investments for initial defensive capability, however, GBI-specific RDT&E has continued to fall significantly (Figure 3.6).12 Between 2002 and 2009, total GMD funding averaged $3.4 billion (2017 dollars) per year. Between 2010 and 2016 that average dips to $1.4 billion (2017 dollars) per year. Recent years and the projections into the FYDP show a slight rebound in funding for GMD and associated programs like Improved Homeland Defense Interceptors (which funds RKV and C3 booster development) and the LRDR. 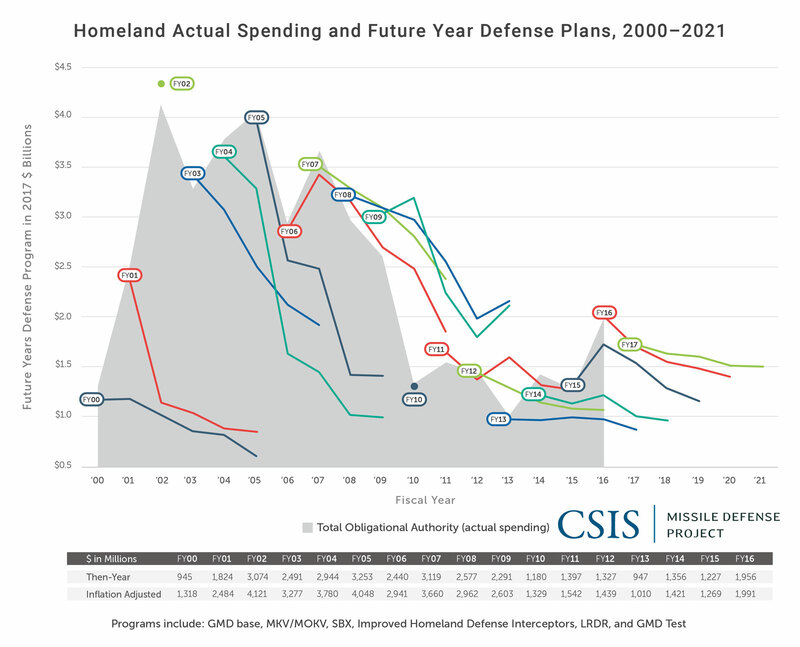 Homeland missile defense–related spending is not simply synonymous with the GMD budget, but the more complete picture of relevant programs also reflects steady decline (Figure 3.7). The proper classification of GMD O&M beginning in 2014 is relevant to showing that operations will be a major cost driver in the future. MDA’s projections for its internal O&M budget continue to rise, but future O&M responsibilities could outpace MDA’s budget projections. Based on historical trends, O&M funding needs to grow at about 3 percent above inflation to meet current needs.13 The MDA overall FYDP between 2017 and 2021 currently projects an average of 3 percent annual growth for O&M after inflation. For GMD, however, the average rate of change for O&M actually declines by 0.6 percent per year over the FYDP, suggesting that O&M costs may exceed projected levels. By the end of 2017, there will be over a 50 percent increase in deployed GBIs relative to just a few years before, from 28 to 44. Non-GMD assets for homeland defense will also see additional expansion. Fort Greely will have a new missile field coming online in 2017, the LRDR will come online after 2020, and at-sea deployment time for the SBX could well rise for either testing or relocation to the East Coast of the United States or potentially eastern Canada. 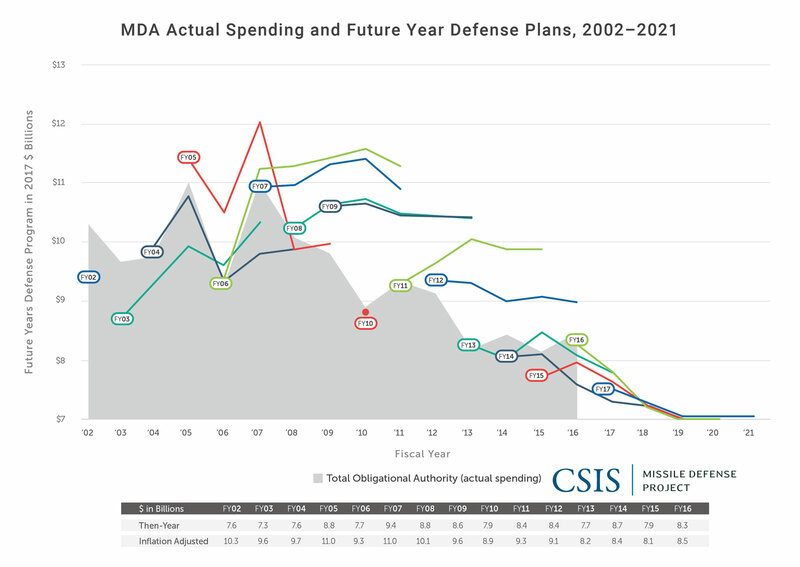 As homeland defense components grow, O&M will likely to continue to rise too, possibly at a rate greater than currently budgeted in the MDA’s FYDP. It is worth noting that the GMD program has never actually spent a single dollar classified as procurement, despite substantial “procurement-like” activity. Interceptors have been bought with funds from the RDT&E account. In 2016, GMD had for the first time a procurement line in the FYDP submitted to Congress, beginning with 2017. The procurement line for GMD later disappeared and that money was moved back into RDT&E, specifically into the Improved Homeland Defense Interceptors line. At MDA’s creation, its task was to develop and field missile defense systems with the intention of then transitioning them to the Services. PATRIOT, for instance, was returned from MDA to the U.S. Army in 2003. Full responsibility for procurement and operating costs for THAAD may eventually transition to the Army, and Aegis/SMs to the Navy. GMD, however, poses a more challenging question as to which service, if any, should assume responsibility for ongoing operations and budgeting. Budget responsibility for GMD is therefore more likely remain with an entity like MDA. 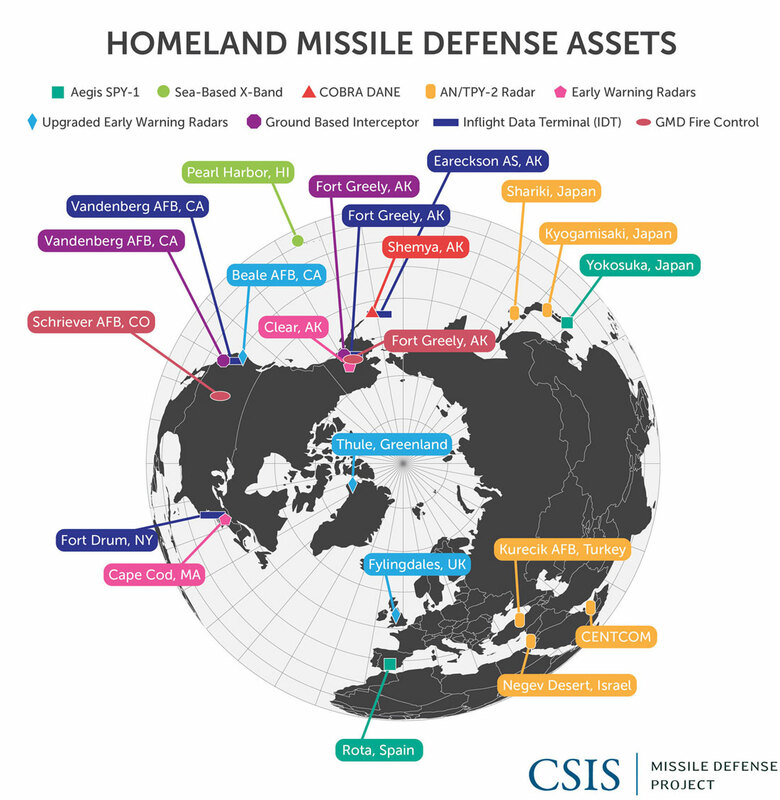 Missile Defense Project, "The State of Homeland Missile Defense Today," Missile Threat, Center for Strategic and International Studies, April 7, 2017, last modified June 15, 2018, https://missilethreat.csis.org/state-homeland-missile-defense-today/. U.S. Department of State, “Treaty between the United States of America and the Union of Soviet Socialist Republics on the Limitation of Anti-Ballistic Missile Systems,” Article III, May 26, 1972. James D. Syring, “The Missile Defeat Posture and Strategy of the United States—The FY17 President’s Budget Request” (unclassified statement before the House of Representatives Armed Service Committee, Strategic Forces Subcommittee, April 14, 2016). Missile Defense Agency, “Roadmap for the Ground-based Midcourse Defense System,” 4–5. U.S. Department of Defense, “Homeland Defense Hedging Policy and Strategy” (report to Congress, June 2013). Missile Defense Agency, “Missile Defense Agency (MDA) Exhibit R-2 RDT&E Budget Item Justification,” Fiscal Year (FY) 2013 Budget Estimate: Missile Defense Agency (February 2012), 2a-72. 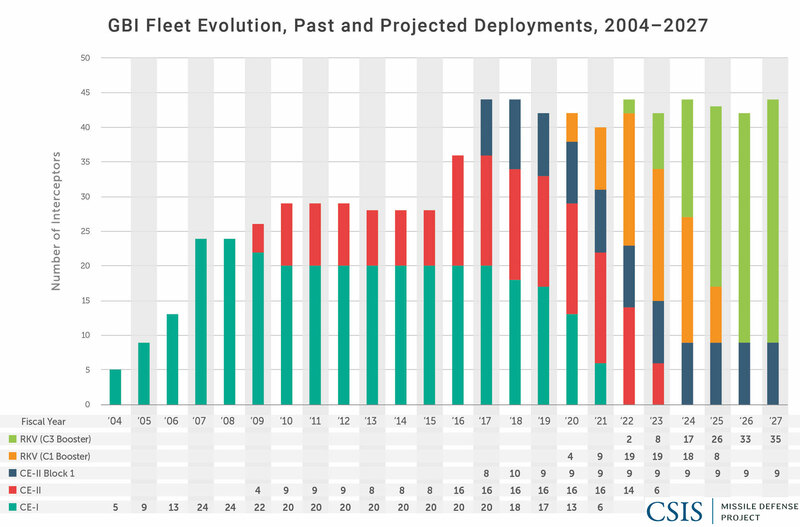 Todd Harrison, Defense Modernization Plans through the 2020s: Addressing the Bow Wave (Washington, DC: CSIS, 2016), 2. Jeff Sessions, “Ballistic Missile Defense Policies and Programs” (remarks during hearing of the Senate Armed Services Committee, Subcommittee on Strategic Forces, 114th Cong., 2nd sess., April 13, 2016). Includes MKV, MOKV, Test Bed GBI, and Improved Homeland Defense Interceptors. Todd Harrison, Analysis of the FY 2017 Defense Budget (Washington DC: CSIS, 2016), 20–22.